I was born in Liverpool, and brought up in the Wirral peninsular. I was educated at Pensby Secondary Modern, Calday Grange Grammar Schools, then Flintshire College of Technology were I studied Business Studies. 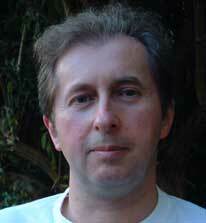 I later obtained a BA Hons in Psychology at The Open University. After training at British Steel (formerly John Summers & Sons) in Shotton, I worked as an Industrial Engineer first for Dunlop, Rubber Plastics Division (now Polybush) in Wrexham, then in Leicester where I worked for Dunlop, Polymer Engineering Division (makers of Metalastik bonded rubber to metal components including GT6 rubber 'doughnuts') and later T J Brooks (the aeronautical fasteners part of GKN). Then I moved back to North Wales to work in the family manufacturing business which I eventually took over as MD. I learned how to build a website (initially using 'notepad' to write html) and eventually won an award from the Craftsman magazine (now craft&design) for Craft Site Of The Year 2001. I later did a course in Web Applications at the Open University. When I sold this business, after over 25 years, I became an Accountant! I have been happily married to Liz for over 30 years, and we have three children. Although I am now retired, I keep busy with my children, grandchild, and my hobbies: photography, classic cars, and websites! I have been a GT6 fan since the 1970s when I first became aware of the car. 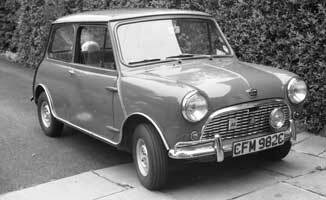 My first car was a 1956 Standard 8 (forerunner to the GT6) which I wrote off after just 6 weeks of ownership. I used to hate them, but letting my father buy a 'car' for me unseen (on my behalf, I still had to pay him the princly sum of £100 for it) I became a proud if reluctant owner. I came to love the car, and it was an exceptionally good example, having had one owner from new, and apart from needing a good polish was immaculate. One dark night I was driving too fast down a suburban road in West Kirby when I encountered a sudden 90 degree bend in the road (I should have known it was there as I knew the road in question, but I was preoccupied). I turned the steering wheel, but failed to negotiate the turn, instead hitting a large sandstone gatepost head-on, knocking it down and ending up straddling it with all four wheels in the air. The front end of the car was bashed in, but fortunately my only injuries were a few bruises and scratches, and shock. A kindly neighbour took me in for a cup of tea, while waiting for the police, who had been called. Very luckily the house, in whose front garden my car was 'parked' was unoccupied. The police were very sympathetic and just took me home to Heswall, my parents were away at the time. I never heard any more from the police, they must have decided that the loss of my car (it was a write-off) was sufficient punishment for my demeanour. I did get a bill for the re-instatement of the gatepost, from the Council, but I don't think it amounted to much. All these cars are today regarded as 'classics'! My later cars were more mundane, although the replacement for the Mini Clubman Estate, an Austin Metro 1300, is regarded by some as a future classic. When I bought it in 1983 it was, in my opinion, a very good car (it was, in fact, Car of the Year). However Metros were made for far too long, eventually finishing production after 17 years (as the Rover 100) in 1997, when they were not so well regarded! 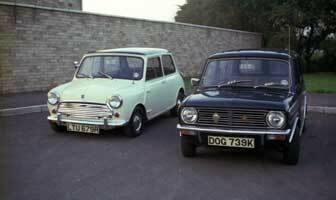 Ironically the classic Mini, which the Metro was supposed to replace, continued for another three years! 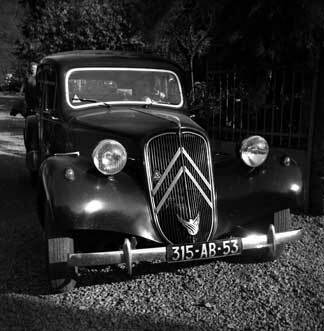 Although I have never owned one, another car which is special to me, is the Citroen Traction Avant. My French grandfather owned one which he purchased in 1953. I loved the car (I can still smell the interior) and called it "La Favourite". 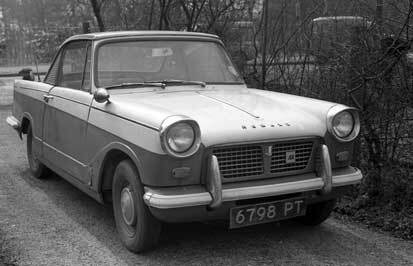 My grandfather unfortunately died prematurely in 1960, but my Aunty continued to use it for a few years (she's in the driving seat above) and my Uncle allowed me to 'drive' it briefly (when I was 15!) so it is the first car I ever drove. I remember it seemed incredibly solid and stable on the road. I also remember a family holiday in it when it took my Grandparents, Parents and myself to Chamonix in 1955. My other interests are Photography (I organised the programme for Chester PS from 2007 to 2019) and Architecture. Click here to see my photography website.